The Lake Erie League has proven year in and year out to be one of NEO's most competitive leagues. With the addition of Lutheran East and a number of teams bringing back key pieces from a year ago, the LEL will be fun to keep tabs on throughout the season. Similar to last year, I make some predictions and let you know what to expect during 2017-18. For the past four years, Cleveland Heights guard Yahel Hill has been one of the "must watch" players in the 2018 class. This season marks the last go around for the senior as he is looking to Cleveland Heights over the hump and advance to the regional tournament. Hill exploded offensively to start his junior year, stringing together a number of 30 point performances leading up to the midway point of the season. The numbers will likely be there again for Hill but first year coach Will Brand will need him to lead the way in all aspects for a senior laden group that will certainly have the size and athleticism to compete with some of the area's best. Jordan Burge (Lutheran East) 6'3 WF '18 - An Ashland University commit, Burge is a physical, ambidextrous finisher who plays with some toughness and grit on the defensive end. He's coming off of a strong junior season where he helped lead the way offensively down in Columbus. Devon Grant (Lorain) 6'1 PG '19 - Not many in the area have a tighter handle on the rock than Grant. Smooth guard that is crafty with the rock and is a proven distributor and shotmaker. Alfonse Hale (Maple Heights) 5'10 CG '18 - Combo guard that can score the ball in bunches. Closing in on 1,000 points and the school's three-point record. Currently holds an offer from Salem International (D2). Taevon Pierre-Louis (Lorain) 6'5 WF/PF '19 - Pierre-Louis is back in Lorain after spending a good portion of the summer in Florida. Versatile inside presence who could show off some of his playmaking ability in Lorain's patented motion offense. Brandon Rush (Warrensville Heights) 6'1 CG '19 - Has a chance to lead the league in scoring. Slashing guard with microwave shooting ability once he gets going. Holds a lone offer from St. Francis (PA). "Scrappy." "Gritty." "Tough." These are words commonly associated with the Mustangs and their uptempo style of play on both ends. You can now add "winning" to that list. Maple finished 7-3 in the league a year ago and returns four of their five starters. The team loses Tyree Harris, who was their second leading scorer, but Coach Eric Schmidt has to be satisfied with the jump that 6'4 senior Keyshawn Ford made this summer. Ford could very well replace Harris' scoring output. The backcourt of Alfonse Hale and Marcus Kimmie may lack in size but makeup for it with their competitive spirit. Deshawn Gardner is a long, two-sport athlete who had his moments last season. He'll be counted on big-time if Maple looks to handle business. I think they'll scratch and claw their way to some wins, possibly matching or eclipsing last year's mark. While I have them finishing right behind Maple, this Cleveland Heights group could very well be the favorite amongst area coaches. Will Brand takes over a team that went just 5-5 in the league last season but returns a number of players who have 3-4 years of varsity experience. Seniors Tyreke Smith, Grayson Green, and LeMaro Smith Jr. are all scholarship athletes on the football field and will be the driving force for a group that is expected to play at a faster tempo than years past. Keith Jackson is an X-factor and showed glimpses of what he can bring to the table with his outside shooting. Javon Roberts enters his second season in the starting rotation and the lefty guard brings an added sense of toughness. Alongside Yahel Hill, the NEO Spotlight pick for top player in the league, Heights is looking to shake thing up in a stacked Euclid district. As Steve Newton of 3rdCoastHoops would say, "The LEL runs through the Steel." With three consecutive league titles under their belt, the Titans have had a firm grip on first place for the last few seasons. Coach John Rositano brings back just one player from last year's group in junior Devon Grant, but there are a few faces in the crowd who are ready to show and prove. It was an up and down year for junior Taevon Pierre-Louis as he bounced back and forth between Varsity and JV throughout the course of the year before cementing himself in the rotation. The 6'5 combo forward is one of the best 2019 prospects in the area and will be a force on the inside. Sophomore wing Jordan Jackson provides the team with another scoring punch while senior Davion Dower will stretch the floor. Expect the combination of winning culture and athleticism prove to be a difference maker with this young group. As if moving up from Division 4 to Division 3 wasn't tough enough, the Falcons are the latest program to join the LEL and I'm sure Coach Anthony Jones and company intend on making their presence felt right away. 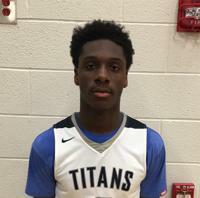 Led by senior Jordan Burge, the team's lone returning starter from a year ago, Lutheran East features some young, talented perimeter prospects in sophomore Davyon Adams and freshman E.J. Farmer. Coach Jones used his team's length and athleticism on the defensive end of the floor last season, resulting in a state championship. Transfers David Gulley, a sharpshooting guard from Solon, and Nehemiah Benson (Streetsboro) must sit out for the team's first 11 games, including six league games. The team will place their focus on the defensive end early on, but they will need someone to help fill the offensive void while reinforcements lie in wait. Warrensville back with standout Brandon Rush, and feature a strong junior class that will be making their varsity debuts in 2017-18. Coach Brian Swift's group is as well coached as you will find in the area and is coming off of some solid performances this past June. Freshman Ramelle Arnold joins Rush in the backcourt and will open some new doors offensively with his playmaking ability, allowing Rush to move more freely without the ball. Shawn Dunnings is also back home where he started with the Tigers as a freshman; he spent the last two seasons at Lake Catholic. The 6'4 senior brings versatility on the defensive end as well as an inside presence that the team was without a year ago. Capable of beating anyone on any given night, I believe the Tigers are a year away from making a run at a league crown. Along with Brand at Heights, Reggie Harnell enters his first year at the helm for the Cardinals and plans to pick up on some momentum that Coach Harold Rasul built over the last two season. Senior Emmanuel Perdue is one of the league's top shooters and averaged 15 points per game as a junior. He is joined by fellow senior in Alejandro Cummings-Washington, an explosive athlete who is coming off of an ACL injury. Expect this Shaw team to play a tough-nosed brand of Cleveland basketball that we are accustomed to seeing from them. The Bearcats enter the new season without Darius Dudley (Richmond Heights), one of the team's leaders on the offensive end, but the future is looking bright as the team features a trio of freshmen in Malik Simmons, Tre Mitchell, and Chaze Harris, all who will be key pieces moving forward. Expect the group to take some lumps but they will certainly have some flashes throughout the year of what the league can expect in the near future. Stay tuned to NEO Spotlight over the course of the next two weeks for more preseason content and conference previews. 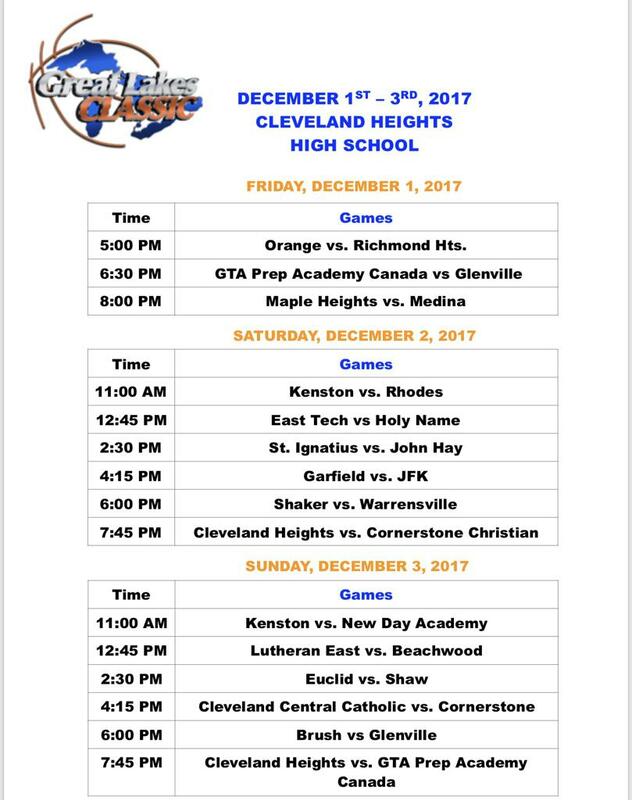 Below is the schedule for the upcoming Great Lakes Classic which tips off the 2017-18 season and features five of the seven LEL squads!